You Can Help Hurting People Around the World! We specialize in setting up outreach & missions services for churches & non-profit organizations. This includes setting up an Internet presence, web pages, video productions, fund raising strategies and project development in foreign countries. We have a heart for helping churches with a vision for missions establish their own independent outreach ministries. In most cases, we can help a church start an effective outreach ministry in Cuba, China, or Russia without taking funds from their current budget. We can help you start from scratch and develop an exciting outreach program in less than 6 months. We don't publish fancy brochures and videos, but we are willing to come to your church, meet your people, hear your heart, and help you set up an effective outreach ministry in just a few months. All work is done on a love offering and expense only basis. To promote Christian values through and character-based resource networking, humanitarian aid, leadership development, community action, and outreach expeditions. Life Outreach coordinates resources with numerous organizations to accomplish common goals. We often send small teams composed of members of various organizations to assess a need and then plan a multi-organizational effort to accomplish our goals. Life Outreach works within all established government and organizational guidelines. We do not support "smuggling" activities that attempt to bring illegal material into any country. We seek to establish strong cooperative relationships between public and private organizations within the countries we assist. If you or your organization would like to explore the possibilities of a cooperative project please contact us by phone, letter, or email. We emphasize short-term outreach expeditions. We build relationships with the people we serve. We bring medical supplies, equipment and medicines to the sick, dying, and needy. We work within the guidelines set by U.S. and foreign governments. We network with many different businesses, churches, and non-profit organizations to bring aid to those in need. We bring foreign ministries and government officials together so that they can serve their own citizens more effectively. We provide opportunities for people with a variety of skills and from many different backgrounds to help encourage those in need. We bring training and resource materials to local ministries through allowable channels. We furnish educational materials, toys, and clothing to sick, handicapped, and needy children. We encourage humanitarian workers, businessmen, leaders, and teachers living in foreign countries. We sponsor character-building activities for young men through Boy Scout Troop 70. 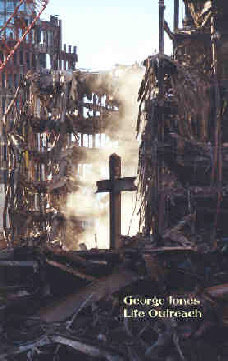 The image has been used by Coral Ridge Ministries (Dr. D. James Kennedy), Thomas Road Baptist Church (Dr. Jerry Falwell Sr.), has been presented to New York Governor George Pataki, Virginia 6th District US Congressman Bob Goodlatte, and Banker Steel Inc., responsible for fabricating the structural steel for the original Trade Towers and the new Freedom Tower being built in their place. A National Memorial Service for fallen Ground Zero Police Officers held at The National D-Day Memorial in Bedford, Virginia, used the image and it was featured in an article in the National Sheriffs Association Magazine. This powerful reminder of God's love for all mankind has been a source of comfort and inspiration to thousands of people all over the world. Each photograph is personally signed by George R. Jones. You may also pay by credit or debit card by clicking on "donation" button. Larger and custom framed prints are available. See Ground Zero 10th Anniversary Cross Photograph! !